Star fruit or carambola (Averrhoa carambola) is a tropical fruit native to South-East Asia, where it enjoys great popularity. Carambola fruit have an overall poor nutritional profile, except for their high vitamin C content which credits them with several wonderful health benefits. Vitamin C is a powerful natural antioxidant, anti-inflammatory and antimicrobial, with immune-boosting properties and an anti-aging action. Regular consumption is said to support artery health by helping clear excess blood cholesterol levels as well as boost immunity. In addition to this, carambola is a great source of antioxidants such as quercetin and gallic acid, both free radical scavengers which protect cells and DNA from damage buildup which may lead to cancer. With a good dietary fiber content, the fruit helps lower blood cholesterol levels and contributes to colon health by supporting fermentation processes that feed populations of good gut bacteria. But what makes carambola so popular is the fact that slices of the fruit look like stars, adding a touch of creativity to any fruit salad or dish containing it. Actually, it is currently one of the most popular ornamental fruit along with physalis and berries. What does carambola (star fruit) look like? Carambola is a slightly elongated, plump yellow-orange tropical fruit made up of five pods, perfectly aligned so that a cross section of the fruit is starfish or star-shaped, hence its more popular name, star fruit. When unripe, carambola skin is bright green but changes to golden yellow when fully ripe. Color is the best indicator of ripeness and it should tell you exactly when the fruit is in its prime. Carambola flesh, seeds and skin are all edible. What does carambola (star fruit) taste like? Flavor depends immensely on how ripe the fruit is. Unripe star fruit are sour like limes, but extremely fragrant. Fully ripe ones are definitely sweet. Ripe carambola has a mild flavor and is quite aromatic, citrusy even. To some it tastes a lot like apples, pears and peaches, to others like apples and oranges. Although ripe, the fruit should preserve a crisp texture, its flesh should be juicy and its skin firm. Carambola (star fruit) tastes good and should make a good impression on anyone who is eating it for the first time. Popular carambola varieties include Arkin, Bell, King and Sri Kembangan. 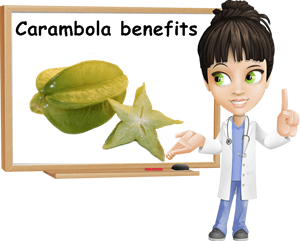 Next, read more about the top 6 nutrition facts and health benefits of carambola (star fruit). 1) Cholesterol-lowering properties. 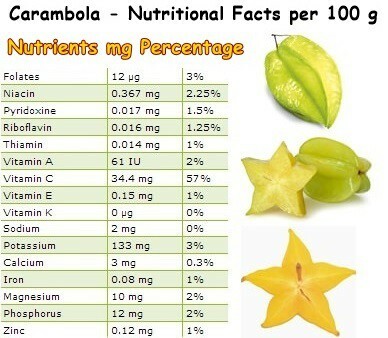 Carambola contains 2.8 g of dietary fiber/100 g of fruit. Dietary fiber passes undigested through the digestive tract and binds to lipids (fat) from food, preventing their absorption at the intestinal level. This helps lower cholesterol levels, contributing to cardiovascular health. 2) Colon protection. The fiber in carambola (star fruit) helps relieve constipation by regulating intestinal transit. Having more frequent bowel movements is shown to protect the colon lining from prolonged exposure to the toxins in stools and, according to research, this contributes to lowering colon cancer risks. 3) Encourages weight loss. Firstly, as a result of its good fiber content, the fruit prevents the intestines from absorbing all the fat from the foods we eat, thus contributing to weight loss. As a general rule, a high fiber intake promotes weight loss. Nuts and seeds are highest in fiber, but also richest in calories. Legumes such as beans and peas and cereals are also great sources of fiber and thus good alternatives. Secondly, carambola has only 31 kcal/100 g of fruit, a low energy value which also encourages weight loss. 4) Excellent antiviral properties. Carambola has an overall poor nutritional profile, with low amounts of vitamins and minerals. However, it is a great source of vitamin C, providing 57% of the RDA. Vitamin C is well-known for its excellent immunity boosting properties, increasing the aggressiveness of white blood cells and thus making them more efficient in dealing with viral and bacterial infections. Taking vitamin C supplements in addition to having a high dietary intake of the vitamin is ideal for reducing the frequency, duration and severity of the common cold and the flu, but also helps support immunity in general, contributing to reduced risk of infection and disease. 5) Offers antioxidant protection. Carambola (star fruit) is rich in polyphenolic antioxidants such as quercetin, epicatechin and gallic acid as well as vitamin C. All of these potent antioxidants hunt down and destroy reactive oxygen molecules called free radicals and prevent them from damaging cells and DNA structures. The buildup of free radical damage occurs over time and presents itself in the form of neurodegenerative diseses (dementia, Alzheimer’s, Parkinson’s disease), heart disease, macular degeneration (loss of central vision), retina problems and even tumours. 6) Wrinkle prevention. Regular consumption of carambola may help in delaying wrinkles as a result of the fruit’s high vitamin C content. Vitamin C stimulates the production of collagen, a protein responsible for skin (blood vessels and organs) structure. A high intake, paired with an overall healthy, natural diet and good lifestyle habits (no sleepless nights and no smoking, for example) should delay wrinkles greatly. However, carambola (star fruit) contains oxalic acid, a natural compound which can be dangerous if consumed in large amounts. In healthy individuals, the kidneys can get rid of small amounts of oxalic acid, but people suffering from kidney problems, notably those undergoing dialysis, should abstain from consuming both carambola fruit and juice. Oxalic acid can be found in spinach as well. Cooking heat reduces oxalic acid content signigicantly in a matter of minutes. Important. The fruit is generally safe for consumption, but there are some restrictions. Because of its the presence of a toxin-like compound called caramboxin, which has been shown to damage kidney nerve tissue, anyone suffering from any form of kidney disease is better off avoiding the fruit. Anyone else is free to enjoy the wonderful health benefits it has to offer.